My pause this time has lasted less than a year! LOL Custom orders are the main reason for my absence (not talking about all my responsibilities in life). They don’t only take lots of time, but lower my creativity for making new things, as I should follow certain lines and things should turn out in certain ways and there is no freedom for my imagination and fantasy to fly far. So I am thinking seriously about not accepting custom orders anymore. 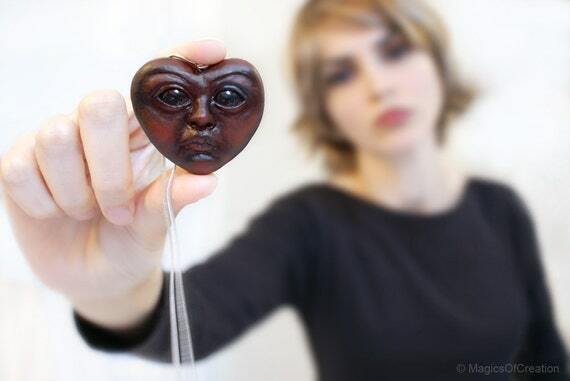 While air dry clay is very light so the pendants made with it are great to wear on a necklace, they are more delicate and need more care in handling. Stones are great for paintings, but only when they are flat and small, otherwise could be heavy to be worn as a necklace. Talking about resins to be used for casts, it is always accompanied by lots of panic for me, as it could be very harmful to health during the work if all the safety precautions are not followed correctly, even if the final result is safe to be worn on skin the person who creates them should be very careful during the process. So I am still working with those materials every now and then, but am back to polymer clay too. At least it doesn’t produce toxic gases like resins do, and won’t put you at risk if you touch them accidentally! I just leave the pieces in the oven and open the window, keep the door closed just to get sure that the air inside the room wouldn’t enter the other rooms, just to be sure that there would be no risks of any kind. Oh, I also wear gloves while manipulating and working with the clay, as I have read somewhere that it doesn’t get off the skin easily, not even by washing with soap and water. You should use rubbing alcohol in order to get rid of the tiny residues on your skin. Here is the first work from my zodiac element signs series realized with polymer clay. This one is for water element signs, I am working on the fire sign right now. The earth and air will be soon there too. I was so impressed by Kings of Leon’s Wall video, so much that I had to let the feelings come out in the form of a drawing! I think the feelings transmitted from Caleb Followill’s eyes and song are well transmitted into my drawing and I can’t be happier with the result! I have realized this drawing using charcoal pencil on the white Fabriano paper, and a mechanical earaser. I was thinking about writing a post dedicated to painting on stone, then I ended up with a speed video of me drawing! Will write about stones another time, ’cause this is my first experience in recording myself while drawing, I have lots to learn to get a better video, your comments will surely help me to get there faster. Comments on my video on YouTube are much appreciated. The music is a simple try on Audiotool website, I didn’t have that time to dedicate to making a real audio. This is a project I began months ago, and could finally manage to finish it recently. 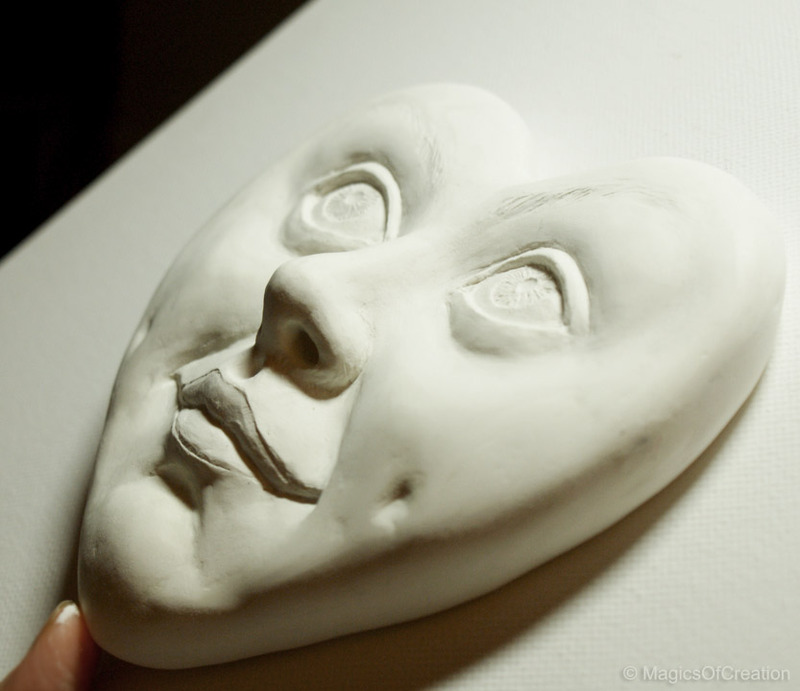 In this post I will tell you how I did the sculpting part. Will show you the painted final result in another post. First I drilled the wood, and inserted two pieces of the thicker metal wire through the holes. Then I fixed them under the heart (to do so I had to drill out a part of the wood under the base). Then I add the two polystyrene balls on top of the wires: first made a hole, then add some glue, and then inserted the wires into them. Then I covered the metal wires first with narrower metal wires and then with layers of paper glued on top of each other. Then covered the paper creature with air dry clay, and gave it the shape I wanted. This step was just about sculpting. Now as you may have already guessed, it’s about a boy and a flower! A lovely famous story. 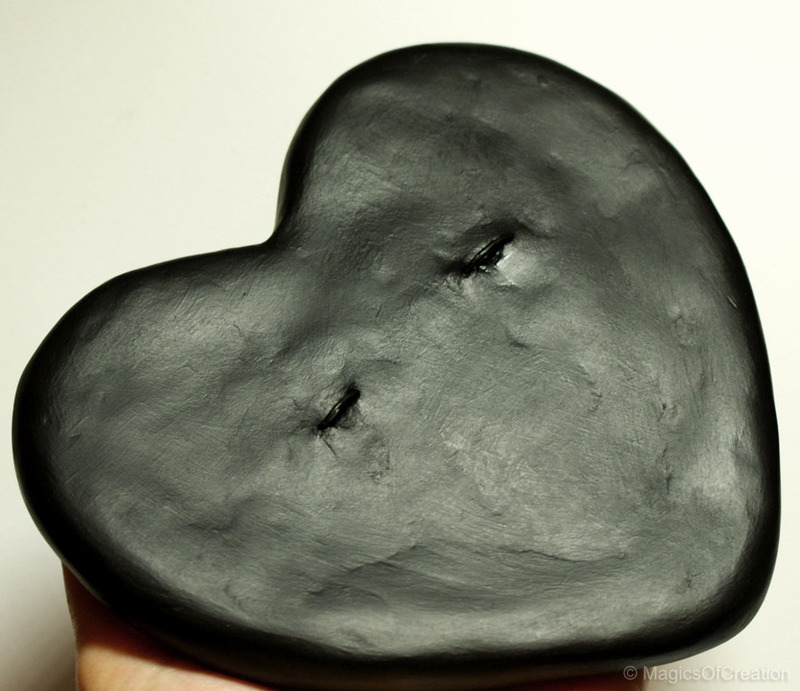 That’s why I chose a heart shape base! For creating the leaves of the flower I used the narrower wire. I covered the flower with paper, then with air dry clay, as did for the boy sculpture, but decided not to cover the leaves with air dry clay, as I wanted them to be slightly poseable. Finished the retouches of the clay sculpture and the work is ready to be painted. 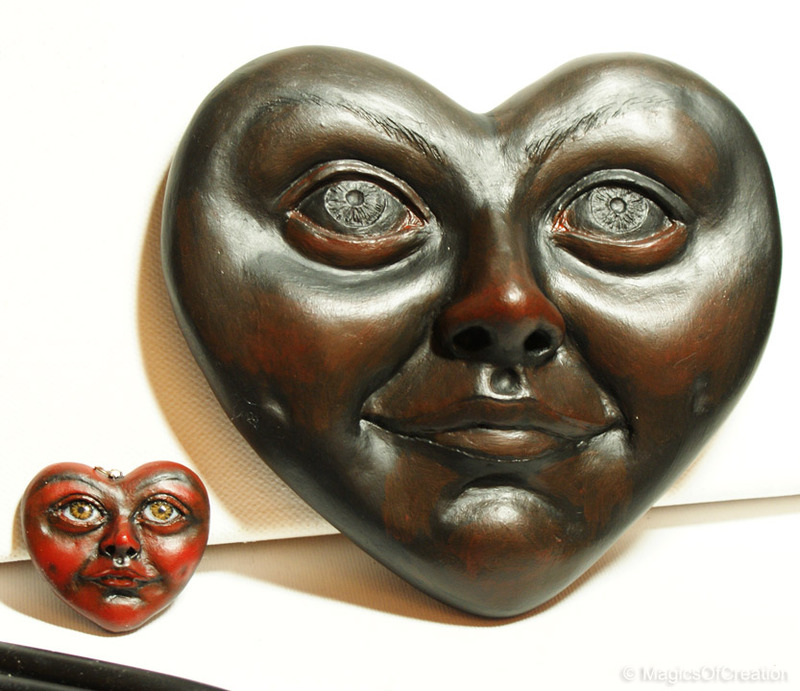 Here are the close ups of these two characters sculpted faces. I have already taken some photos of the finished project after being painted, but am waiting for the sun to take some better photos, as the details are best seen by natural light. We have had a spring much similar to autumn this year, it is so often cloudy and rainy, and some days even a bit cold! If you have any questions about this stage, please feel free to ask in the comments. As I was saying in my last post, I am a moon lover! There is something so poetic, so romantic, and so mysterious with the moon. The great fact about the DichroicCreations supplies is that the seller as an artist and creator has been using the supplies she sells, on her own jewelry. She has chosen the best quality products after many years of experience. And of course you will love her jewelry too, her creations seem to come from another planet and time, or a parallel world? The colors and the way she mixes them are really fascinating. Each year a new technique?! I had lost the count, but today visiting my blog I noticed that I haven’t posted anything for a year! Against the last year, being concentrated on resin cast reproductions, this year I have been concentrated mostly on some more natural technique, that is painting on stones! We live 10-15 minutes far from a lovely river “Trebbia”. The valley in which this river flows “Val Trebbia” is the most beautiful valley in the world, according to Hemingway! What is more inspiring than walking along a lovely river side, looking for the stones which could be turned into different kinds of creations? I use acrylic colors to paint on my stones, and then after a couple of days, when the colors are completely dry and cured, I apply several layers of varnish on them. Here is my recent work, it’s a lovely romantic scene, isn’t it? It could be used as a home decor, or a table or shelf decor. I have created several pendants or art stones with the moon theme during this year. I am a moon lover, what about you? After a long pause I’m finally back. During this time I have experimented different materials and studied a lot about a more resistant material for my art jewelry. Well, the answer was resin. 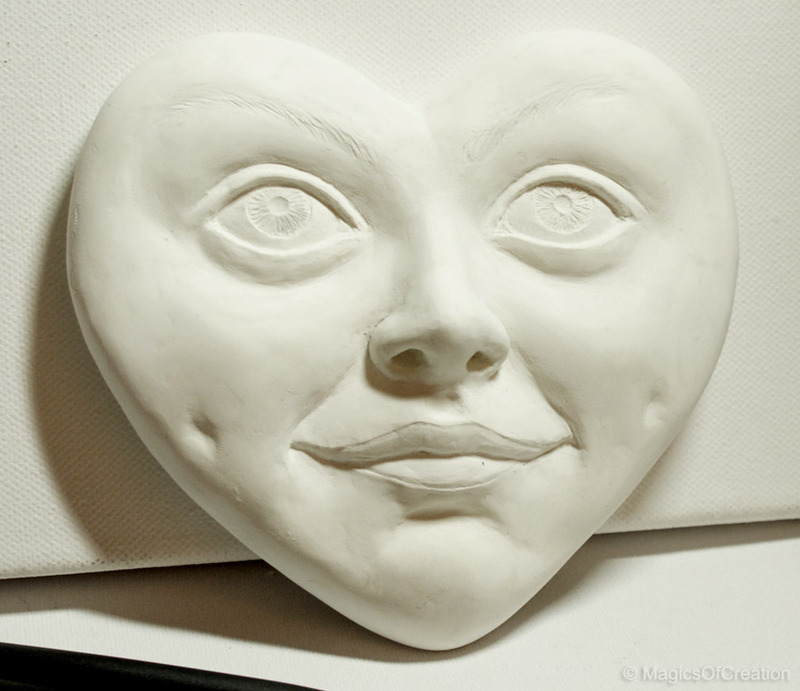 I will write a detailed post about the materials, molding and resin casting in the near future. There are lots of things still to learn, however I have achieved a good point in this technique and I like it. This resin is for sure much sturdier than the air dry clay I used before. Though my new pendants are casts they are still unique, as I paint them by hand, no two paintings are ever the same. The work procedure is long, even if it may seem easier than creating the sculpture from scratch, it still needs almost the same amount of time and attention to details. I thought that this could be a great gift idea for a lady, or a beautiful surprise for a man seeing his lady wearing a heart pendant with his zodiac sign and constellation painted on, to show her deep love for him! Now lets talk about resins. 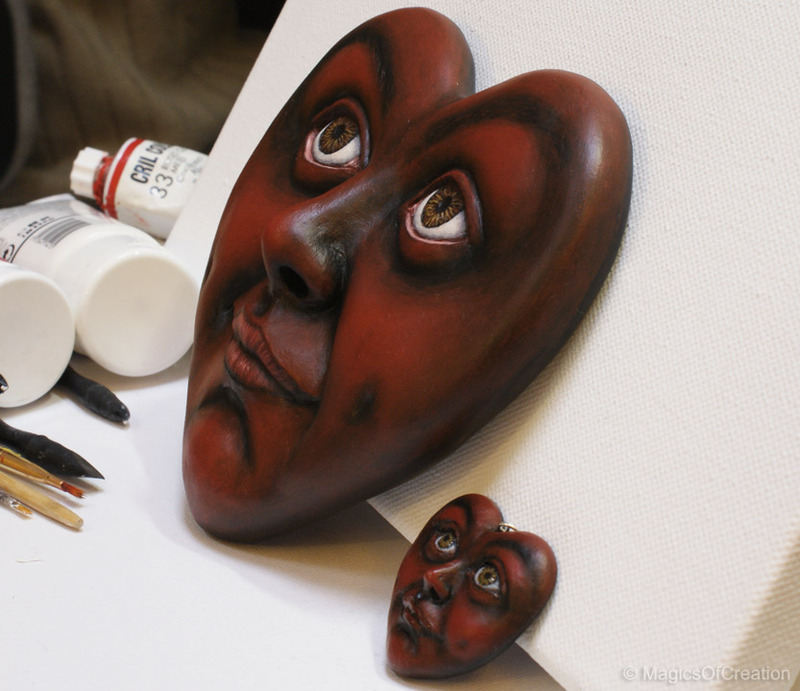 I usually add a layer of resin to the eyes and lips of my air dry creations to give them a more natural look. I have tried all possibilities for resins, from UV curing resins to epoxy resins. After many hours of research on internet, and different experiences, no I can announce what works best for me is Brilliant Resin. This product is the best and less toxic epoxy resin I have found, and besides creates really few bubbles, so I will just cling to it! Now let me tell you what happened during the resin stage… I’ve been used to small scales for my creations, this custom order was a bit big, and as the resin is very liquid, the doming surface as we see on a real eye, didn’t happen . I was trying to create the doming effect playing with the resin which was hardening gradually using a brush, and gravitation always made the resin flow downward, even when it had become thicker. Then I noticed that many tiny bubbles were created by my efforts, and that was not pretty at all. After getting sure that the bubbles were not supposed to disappear and that was when the resin were almost cured, I decided to tear it off and retry with a new layer of resin. And there happens the tragedy: the colors were torn off together with the resin as they were completely attached to it. OMG! OK, I admit that this had happened to me before, but not with a resin that was not yet completely cured! This time the resin seemed elastic so I was convinced that tragedy wouldn’t happen again. Unfortunately I was wrong, however being in the same situation before, I soon overcame the bad feelings. Hey, I had a new piece to paint, that’s fun 🙂 and I generally love painting the eyes. Yes, I love the result. And it was fun to repaint the eye, trying to keep it similar to the other eye’s colors. This time I just added the resin. Forget about the doming effect on such a big surface for now. I should discover the right method for that. Anyways, the lesson learned: will never ever touch the resin which has gone through hardening stage! When it’s done it’s done, no way to turn back or modify, or all the work should be redone. AT least this is what I’ve learned up to my personal experiences. Next step was adding the varnish all over the sculpture, and then applying the resin to its eyes and lips. There are many kinds of resins, I first used UV curing resins, but that worked well on summer with sun shining strongly. I bought a UV lamp box but the lamps were exhausted so quickly and won’t buy anymore stuff like that. I discovered epoxy resins recently, searched days and nights on the internet until I finally found my favorite epoxy resin, the least toxic and most easy to use! Being based in Italy it’s not really an economic choice, ’cause it comes from US and I should pay almost the price of the product itself only for the shipping! However I really care for non toxic products, besides this resin cures very fast and with less bubbles in respect to the other epoxy resins I had tried. If you’re interested to know what its name is just let me know.